Since 1955 Allegheny Valve and Coupling has been dedicated to the tank transport industry. Allegheny was the catalyst of the industry wide conversion from schedule 40 to schedule 10 thin walled pipe on tank transport vehicles. We then designed valves and fittings for the new interchangeable lightweight designs. 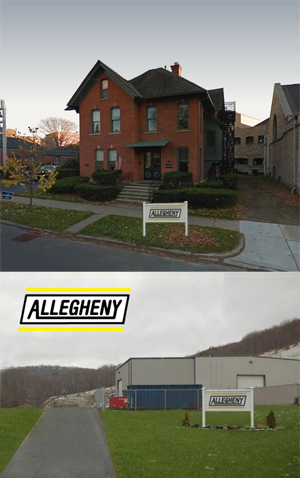 Allegheny’s fittings became the standard in the industry as it remains today. Our company is still owned by the same dedicated family. We continue to design, manufacture and directly sell our products to our loyal customers, who throughout history, have returned time and time again to purchase our safe dependable products. We are pioneers in the Petroleum Transport Industry! Our mission at Allegheny Valve & Coupling, Inc. is to design, manufacture, and supply the highest quality lightweight products for our customers in the liquid and dry bulk transportation industry. We are dedicated to providing value added service beyond our customers’ expectations, achieved through a desire to anticipate and fulfill our customers’ needs. We strive to constantly achieve higher standards in engineering and quality, for the benefit of our customers' safety and prosperity. Allegheny aims to create mutually beneficial relationships with each of our customers. With fairness, honesty and intelligence our staff guarantees their commitment to delivering outstanding performance and support to our customers. We Listen, We Act !